I will be emailing you all separately, and I hope you can drop by S&R tomorrow to pick up your respective prizes. If you can’t pick them up or send someone to pick them up, you unfortunately forfeit the prizes… :) Thank you so much to all of the “contestants”. Maybe I need to do this sort of thing again… Did you have fun??? i mean prizes, not prices. and may i add..the packaging looks equally delicious! wow is that cloth? or something like cinamay? Actually, it’s refreshing to go to a website where the search function works properly! A LOT of websites have a so-called search function in the website that’s plain crap. or how about a jam recipe? btw, where do i find pectin on retail here in the qc? kayenne, all the jams given as prizes here have been featured on the site before, there are recipes fo kalamansi, mango and mangosteen jam in the archives, use the search function… :) And I haven’t found it necessary to use pectin in any of the jams (though it may have worked wonders on the mango jam). yes, it was a lot of fun. i’m a new reader and enjoyed getting sidetracked by the flower posts. thanks for setting this all up (boy, how much did i want those bottles of jam…). Congratulations to those who won! ‘Til the next contest. oh kahit nd ako nanalo i really enjoyed the game, parang solve ng puzzle dun sa da vinci code. it was a fun game and a great way to catch up on the posts i missed. thanks! thanks MM! i’m relatively new to your site, compared to others that i’ve been following over the past couple of years. but you got a wicked site! i did enjoy the treasure trail and remember finding a couple of them to be totally hilarious! i sent you a message via the contact page the other day. just checking if you got it. I had lots of fun, even if I think I had the largest shoe size of all! oh well, there is always a next time. and i surely had a blast looking for the clues!!! congratulations to the lucky ones, and MM thanks again for keeping us on our toes with this truly fun treasure hunting all week long!!! I have a lot of fun doing your treasure hunt. I almost give up following your clues when I got stuck on Clue #5. So I told myself win or lose, its interesting to read your old post…where have I been all this time??? ?Got to catch your old post again :) See you tom. Congratulations to the grand prize winner! Lucky, lucky you! I think I’ll just be forced to make one of these jams….except for the mangosteen(off-season na yata) jam which I truly truly crave…:) btw, interesting posts! it was an enjoyable read. congrats sa mga nagwagi! it was fun, i enjoyed it immensely even though it took me forever to get to the last clue. kahit talo, i had fun MM! please do it again para sa mga talunan. it was really fun. i really want to find the treasures but it was already 12MN and need to go home.. anyway, i will just buy the shirt tomorrow. Thanks for the fun.. Next game please! I am absolutely thrilled to be a runner up! I would definitely try my luck again and again and again. waaahhhhh!!! huhuhuhu…I’m so malas talaga when it comes to raffles! anyway, congrats to the winners! very pretty packaging MM! CONGRATS!!! its not true that you’re malas sa raffle! you’ve won! kahit na runner up lang! YES! Let’s have a repeat of this game. It’s so fun and challenging looking for clues. CONGRATS to the winners! Kakainggit naman. congrats to the winners! galing! whaah! i lost! but it’s ok, i sure had fun and learned a lot from rummaging through the previous posts! Congrats to the winners!! saya!! I’m pregnant and salivating over your jam photos…how about another contest?!! ok… i’m seriously on a mangosteen high… just thinking about it! you brought back too many coffee-mangosteen memories from your old entries and a friend i’m chatting with on ym now is getting worried. all the mangosteen talk had given me several ideas that i’ve noted down on how else to use mangosteen… and i can’t wait to try them… i wonder if i can’t use mangosteen wine to make the syrup if i can’t get at the real thing? Huhuhu…i didn’t win…any way congrats to the winners!!! It was a fun contest Mr. MM. This also made me catch up in reading all your previous posts…super informative…galing!!! Happy Anniversary and God Bless. It was an exercise in endurance. It really wasn’t difficult. You just gotta hang on and look through all the possibly relevant posts. =) But it was fun getting sidetracked especially reading posts that I had never seen before. That Crabby Diner was to die for! I’m a mid-2007 regular reader so it was really interesting. But shucks! I didn’t win! I’m dying to try mangosteen jam. gusto ko pa nman matikman ung mangosteen jam! sayang!!! it was fun fun fun!!! HAPPY THIRD BLOGBIRTHDAY AGAIN MM!!! aw I did not win :-( I had fun though! Til your next game contest hehehe Congratulations to the winners, I am sure they will enjoy those jams especially when partnered with a hot pandesal. Oh how I miss this pinoy delicacy. More power MM and I look forward to your holiday menu and decor! Warm thoughts from New Jersey. 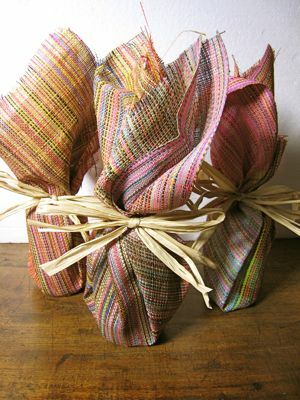 I love your creative idea of using raffia/buri to wrap gifts! Thanks. This was a great idea. You’ve totally inspired my christmas. I’m going to try a few of your decorating tips. Even though I haven’t got the jam, I still feel I won. I might even attempt a gingerbread house. I’m on my way to collect t shirts and totes now. Kahit may winner na I still did the treasure hunt this a.m. and it was fun going through your posts again and I can only say I’m definitely a diehard fan of MarketManila! Impressive! 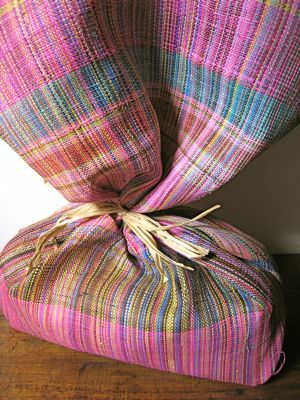 I’d love to get my hands on those gorgeous ruffia wraps! MM, i was unable to pick up my prize ‘coz i was in baguio with my family this weekend. by any chance, can i still claim my prize? am so sad kasi hindi na nga ako nakakuha ng t-shirt and tote, hindi ko pa na-pick up prize ko..huhuhu..and i said pa naman before na wala akong swerte sa raffle. bedazzle, let me check when I get back to Manila if it was already given to someone else… I will be back there in a few days, remind me then… thanks. i love your wrapper…where did you get the cloth? congratulations to the winners.. i actually tried but didn’t finish the search coz i was constantly distracted by the older posts and i realized MM, yours is truly an amazing site, the pictures and the articles are outstanding! so beautiful! congratulations!! Hello Marketman,I was wondering where you can get jars like that? I’m planning on giving candy in jars for christmas and I don’t know where to get those generic glass jars like the ones you use for your jams. Thanks! Lorraine, San Miguel Packaging Products sells generic jars.